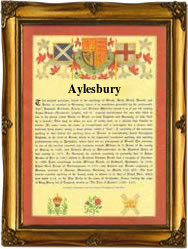 Recorded in several spellings including Ailsbury, Ailsberry, Aylesberry, Aylesbury and others, this is an English locational surname. It originates from the small town of Aylebury once famous for its plump ducks which found their way onto many an eating table. The place name is first recorded as Aegelesburg in the Anglo-Saxon chronicles of the year 571 a.d., making it one of the earliest known recorded places in England. This was absolutely at the very dawn of written records, there are few indeed which predate this one. The name means Eagle's hill or fort, with the former being a given name, there were no surnames for another seven hundred years. As to when this surname was first recorded is uncertain but the early surviving London church registers give examples such as Martyn Aylesbury who married Anne Linley at St Margarets Westminster, on November 25th 1546, and Edward Ailesberry who was a christening witnesss at St James Clerkenwell, on December 22nd 1657 in the "reign" of Oliver Cromwell, (1650 - 1658).